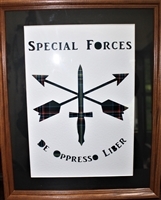 Matted in either black or white with a laser die-cut Special Forces insignia done exclusively for us by BraveArt in Scotland, we think this would make a stunning addition to any SF soldier's home. Also available in your choice of frame, black or provincial. Bespoke kilt made to measure from the Special Forces tartan, a restricted tartan handled exclusively and woven in Scotland for Blackthistle Designs. 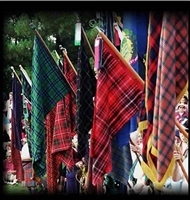 PLEASE NOTE.... your DD214's HAVE to be presented and vetted to be able to order your kilt. Please know your information is handled discreetly and destroyed upon verification. Any personal information may be blacked out upon submission of the paperwork, as long as your name and MOS are visible on the papers. Please call or message us directly with any questions and to order. Contact us first, while we vet your papers we will send you an SF kilt kit, which you will need. It contains meausrement charts, bespoke contract and samples of both the SF tartan and the SF silk. By the time we get all that, you will be good to go and we will continue to process your order with payment. Please note: Both full payment and partial payment will incur shipping charges that include priority, insured shipping and a signature is required for delivery UNLESS you message us if you prefer that waived. Balance due can be paid at anytime and does not include the postage charge paid in your initial payment. A bespoke kilt made to measure from the new Team Rubicon tartan, a restricted tartan handled exclusively by and woven in Scotland for Blackthistle Designs. PLEASE NOTE, this kilt is controlled and restricted to eligible wearers only and your Team Rubicon ID# has to be presented for verification to be able to order your kilt. Your number will also be included on a specially embroidered identification label sewn inside your kilt, making it truly a personal, bespoke item to cherish. Please know your information is handled discreetly and destroyed upon verification. Simply put the numbers into the customer comment box at checkout or email them. As well, feel free to call or message us directly with any questions. Upon receipt of your order, we will send you a Team Rubicon kilt kit, which you will need. It contains detailed measurement charts with instruction and a bespoke contract for commission. As soon as the first run has been completed, it will also contain a samples of the tartan. Until then, we will put in a sample of another tartan of the same weight by the same weaver so you can see the excellent quality from which your kilt will be made. You have your choice of either full payment or deposit at checkout. Balance due can be paid at anytime but completed product does not ship until payment in full has been received. At this time, we are looking at a 10-12 week start up time. Once that starts, we will be running on a regular basis like our other kilts of 6-8 weeks, but can always handle a rush or expedited delivery subject to special fees. 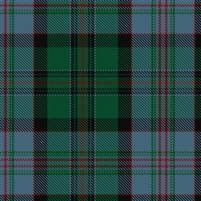 A photo of a completed kilt will be posted as soon as it is available.